Portable Banner Stands available at great discounted prices! The Double Sided Orient 2 Retractable Banner Stand is designed with quality and value in mind! This easy to assemble retractable banner stand is finished in anodized silver with heavy duty molded end plates. 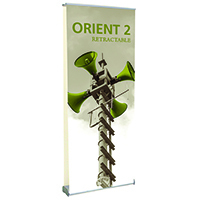 The Orient 2 Banner Stand comes with a padded carrying case for ease of transport as well as convenient storage. All Orient Retractable Banner Stands are an eco-friendly product choice! Banner Stand Lighting is also available, sold separately!